Hey there, friends. 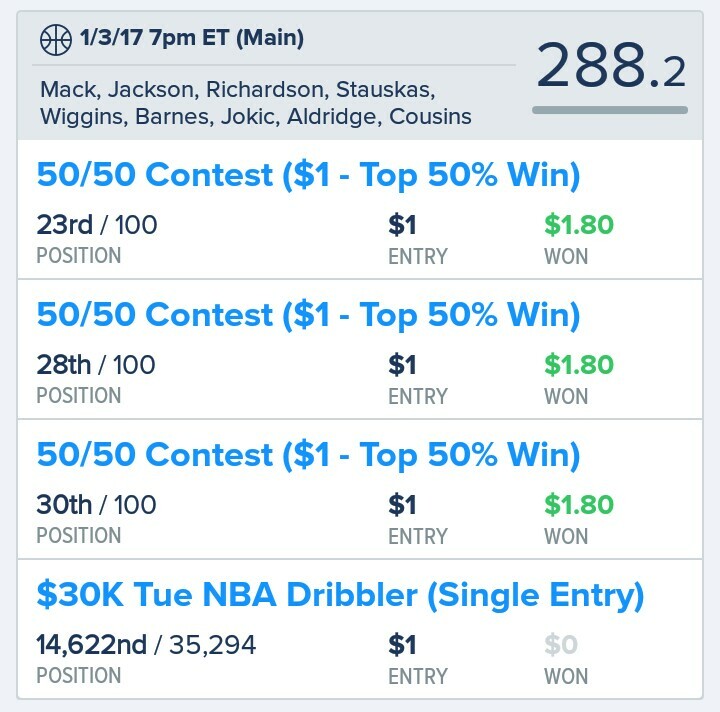 Ready for another lineup for Fanduel's main NBA slate of games tonight? If you ended up using my lineup from yesterday, you might have ended up a winner. I did. I managed to score cash on 3 out of 4 games. In the end of the night, I ended up winning $1.40. Yeah... it's peanuts, but a win is a win! So let's dive right into it! Goran Dragic: The Miami Heat are not at full strength and only suited up 8 players last night. They are expected to be depleted again so I expect the players on the floor to come up with high usage and big minutes and no one plays bigger than Dragic on the Heat tonight. Malcolm Brogdon: The kid is a great value play and if he continues to start for the Bucks, he'll be worth the pick up. He's had at least 5 times his value in his last 4 games and has the potential to go even higher. Giannis Antetokounmpo: The Greek Freak has been monstrous on the floor as of late. With 40+ fantasy points in his last 4 games, I expect him to tear up that no defense Knicks team to shreds tonight. Josh Richardson: Same deal here with Dragic, the Heat are low on players and each one that is on the floor should come up big. Richardson didn't do so well last night so I expect him to make up for it tonight. Jimmy Butler: JIMMY! He exploded for 80+ fantasy points in his last game and he should continue to be the man in Chicago! A high scoring game is in store in Cleveland tonight and that should give Jimmy plenty of opportunities to rack up those points. Aaron Gordon: Gordon is a very streaky player. He can get you 30+ fantasy points on any given night but can also put up a sub 20 fantasy score as well. I think that tonight, he'll have a positive outcome since they'll be up against a high scoring Atlanta team. Serge Ibaka: Ibaka tends to fill the stat sheet nicely. He's almost a guaranteed 20 point game night from Ibaka so if he can get rebounds, steals, blocks and he's a sure fire 30 point fantasy guy! And at under $7K, he's a must have. Jabari Parker: Another great player alongside the Greek Freak. Parker has punched through the 30 fantasy point mark in the majority of his games, hit the 40 fantasy point mark a few times, and topped out at 50+ fantasy points. Parker has the potential to score massive points every night he's on the floor and I think the opportunity is there tonight against the Knicks. Willie Reed: Reed is my value player of the roster. No Whiteside, no big bodies available, no problem picking up Reed for big minutes. I'm hoping he'll make great use of the opportunities given to him and considering that the Heat only suited up 8 players last night, the opportunities should be there! So there you have it! 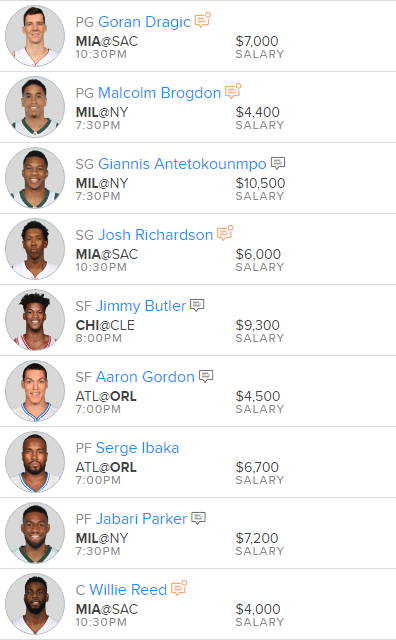 My lineup for tonight's slate of games. This lineup is not final, and is just my initial lineup. The deal with fantasy sports is that you need to keep informed know who is playing and who isn't. I'll change my lineup accordingly to take advantage of the potential matchups created so make sure to follow me on Twitter to receive any late day lineup adjustments! 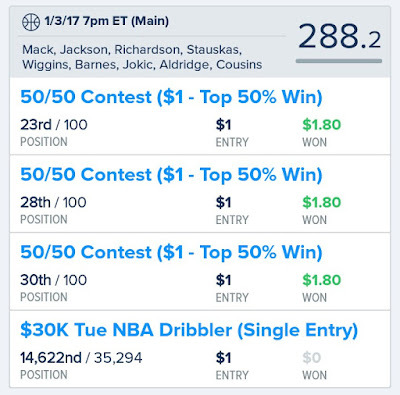 Want to get in on this Fanduel action? Sign up here! Good luck, friends!